On the one hand, just five individual Billionaires in Britain get to control 80% what you read in printed media and on the other hand, just five Internet Service Providers get to control what 87% of people get to see on their devices. Both are heavily influenced by government. It is no wonder what the public think is a misinterpretation of the truth. In fact, so far from the truth, it is more a departure from reality. Propaganda works! Jones makes a good point in highlighting “how the media controls Britain” and how it reveals the schism between popular British sentiment about key social issues courtesy of media influences and reality, indicating that the “establishment” is more than happy to sow discord within the working/middle classes using its traditional “objective” distribution channels, while it remains aloof, collecting the rent its record capital provides. For instance, the book says, 24% of the population think that British society is Muslim, the figure is actually 5%. 31% believe the British population are immigrants when it’s 14%, 27% believe social security money has been fraudulently gained when the figure is 0.7%. It continues with statistics that distort the truth such as 41% of the public believe all social security money goes to the unemployed when it’s actually 3% and 29% of Britons think more taxpayers money goes on jobseekers allowance than on pensions – when 15 times more money is spent on pensioners. This clearly demonstrates just how much that the media controls the minds of the general public. It is how propaganda is peddled so effectively by the very rich and very powerful to reach their goal of attaining even more wealth and power and to stay there. In terms of Britain’s media, the reality is that there are 5 billionaires who run our media, and they have huge power in our democracy forcing our political parties to prioritize their wishes over the wishes of the British public. These 5 people not only own 80% of the newspapers we read every day, they also own TV stations, press agencies, book companies, cinemas, so everything we think or speak about in Britain is nearly controlled entirely by these 5 men. These are the men in control : Rupert Murdoch, Jonathon Harmsworth, Richard Desmond and the Barclay’s Twins. None of these people live in Britain. They dominate and monopolise our culture and that is a disaster for democracy, because it means the wishes of the super wealthy 0.1% dominates our governments actions. The recent revelations in Lord Ashcroft’s book finely tunes the thought that the wealthy buy power and when they don’t get what they want, well, ask David Cameron! However, behind the principle that the media in Britain has been highjacked by the vested interests of corporations such as Murdoch’a News Corporation, a company that now ranks as the worlds fourth largest media company, there is a much more sinister side to how media and their messages are disseminated in Britain. Essentially, to be a news or current affairs publisher you must be registered as such with a government regulatory body. That this is a despicable idea goes without saying: it’s a reversal of the past three hundred years of liberty where we’ve been allowed to say or print whatever we want to subject only to the laws of libel, incitement to violence and pressing concerns of national security. If a news or current affairs publisher is taken to court, by anyone, including the state, and not registered then no matter the outcome, in all circumstances, win or lose, the publisher loses and can’t claim costs. The three politicians who dreamt up this suppression strategem are the Prime Minister, the Leader of the Opposition and the Deputy Prime Minister of the time in 2013. In itself that’s an interesting commentary on the quality of those individuals and what they think of democracy and freedom more generally. Of course, over recent years restricting press freedom in the name of national security has been a focal point for government. The UK’s lack of constitutional guarantees for freedom of expression were only some of the things criticised in a new report by the World Association of Newspapers and News Publishers (WAN-IFRA). The organisation represents over 18,000 publications and 15,000 websites in over 120 countries. Referring to the UK’s influence internationally WAN-IFRA says: “How changes to the system of press regulation are managed in the UK will have an unparalleled impact beyond its shores.” They fear that a regulator with government involvement risks being “an open invitation for abuse” of press freedom. The report in many ways echoes Index on Censorship’s position on press regulation and threats to press freedom in the UK. The report comes after concerns were expressed by UK media and press freedom organisations over the state of press freedom following the Leveson debate, and the threats and pressure faced by the Guardian over their reporting on Snowden and mass surveillance, culminating in the destruction of hard drives in the Guardian’s basement overseen by GCHQ representatives. The speed of implementation of new rules, the lack of legislative scrutiny, parliamentary vote or public consultation was criticised, with the report arguing the whole process should have been more transparent. PM David Cameron’s claims at the time of The Guardian incident that the reporting harmed national security, with no evidence to back this up suggested an unprecedented level of political interference in the freedom of the press. Around the same time, a court judgement finding the detention of David Miranda (partner of Glen Greenwald, reporter at The Guardian) legal under the UK’s Terrorism Act suggests that the government is unconcerned with press freedom and arbitrary detention and more concerned with its own agenda – damage control. Laws have now extended into curbing social media by criminalising it and censoring the internet by way of introducing online filters. It was always going to be an easy win, harping on about the need to protect children and threatening internet service providers with legislation if they didn’t comply with prime ministerial demands over filtering. The government then introduced a “whitelist of websites” to counter indiscriminate ISP’s site blocking. At the ISP level, on public wi-fi and via mobile operators, the UK will be subject to a substantial amount of network-level filtering. The new network-level filtering from both ISP’s on the one hand and government on the other increases the level of over-blocking. The government’s filter blocks far more than just dirty pictures though. That was always the intention, and it has become clear that the mission creep of internet censorship is even creepier than campaigners had feared. One ISP now uses these restrictions to cover “sites with information about illegal manipulation of electronic devices [and] distribution of software” – in other words, file-sharing. As The Guardian says “It looks like a convenient way to block a lot of content the British government doesn’t want its citizens to see, with no public consultation whatsoever”. With minimal argument, a Conservative-led government has given private firms permission to decide what websites we may and may not access. This sets a precedent for state censorship on an enormous scale – all outsourced to the private sector, of course, so that the government does not have to hold up its hands to direct responsibility for shutting down freedom of speech. Just 5 billionaires and 5 ISP’s and about as many government officials are controlling what you read and see and manipulate what you believe to be factual and real. Propaganda works! It appears that it isn’t enough that government officials and their agencies do things such as listen in on phone calls, take illicit images of you and your family, read your emails and troll through the web browsing histories of everyone. 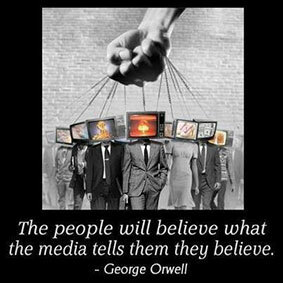 They want to control not only what you read and see, they want you to believe a manufactured story to keep them where they are and keep you where you are.